In any draft past 1992, Richard Dent would have been an undrafted free agent in the NFL. He was selected as a skinny defensive end from Tennessee State in the eighth round in 1983, and played sparingly on defense his rookie season. He did start 3 games and compile 3 sacks that year, which would average out to an All-Pro full season. In 1984, despite starting just 10 games, Dent racked up the highest sack total of his career with 17.5 and made his first Pro Bowl. He followed this up with another Pro Bowl and All Pro season in 1985, leading the NFL with 17 sacks, 2 interceptions, 7 forced fumbles and a touchdown. He was named MVP of Super Bowl 20. Dent went on to compile double-digit sacks in 6 of the next 8 seasons, playing in 4 more Pro Bowls. 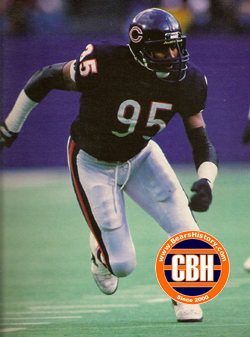 Following a strong 11th season in 1993, Dent rejected the Bears' contract offer to be a moderately-paid pass rush specialist and instead signed with the San Francisco 49ers. He would only pay in 2 games there before breaking his leg, and briefly returned to the Bears for 3 games in 1995. He finished his career in 1996 and 1997 with the Indianapolis Colts. Dent is the Chicago Bears' all-time sack leader and tied for 6th on the NFL's all-time list. He was frequently a finalist for induction into the Pro Football Hall of Fame until FINALLY being voted in with the 2011 class.